An article regarding a farmer case study has been published at OneIndia News showcasing how RobotiX helped the farmer during his difficulties while managing the farm. 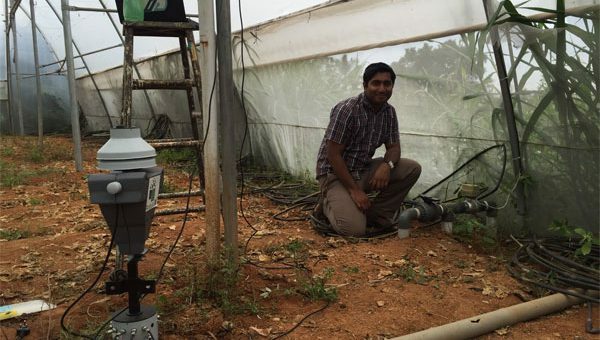 The solar powered product, two kg in weight and 40 cm tall, comes equipped with sensors that monitor crop health, but also soil temperature and humidity, and the microclimatic conditions such ambient Temperature and humidity. It also provides the farmers with real-time data through phone notifications and also the companies android app in five languages- Telugu, Tamil, Kannada, Hindi and English- helping them make the right decision like the right time and level of irrigation, required, among others. RobotiX helps the farmers choose the right seeds, the right crops for particular kinds of climate, soil etc., and will also eventually be able to forecast which crop will be the best for the land and what the output should be if all the criteria are followed. The company also puts users directly in touch with experts who help them guide through such choices. Putting all this together has not been easy for the team at eXabit, a company founded by four engineering college friends, Amulya Mishra, Avinash Agarwal, along with Mahapatra and Sahoo. While they had always planned to do something of their own as Sahoo explained, but after college, they all went their separate ways, as all them ended up working for various multinational companies. “But we never forgot our original plan,” recalled Sahoo. An article for top tech 25 award ceremony at Bengaluru has been published in your story. eXabit systems got the award under IT/ITES section showcasing solutions for both pre-harvest and post-harvest agri business segments. Bengaluru, known as India’s startup city, has got a shot in the arm with the government recognising the new-age entrepreneurs in the city as well as the state with the launch of the Startup Karnataka Top Tech Awards. This is a move to recognise promising startups from Karnataka, including those from tier two and tier three cities. “This is the first time the government has come up with such a category of awards. We want to encourage 20,000 startups in the next two years with at least 6,000 of them in product-related ones. Our effort is to fund up to Rs 50 lakh per startup registered with KBITS without asking for any equity. We all know that 90 percent of startups fail because of lack of mentorship, facilities, funds, or for a combination of all of these. By funding and providing support, we hope to make more of them successful,” said IT, BT and Tourism Minister Priyank Kharge while announcing the awards. 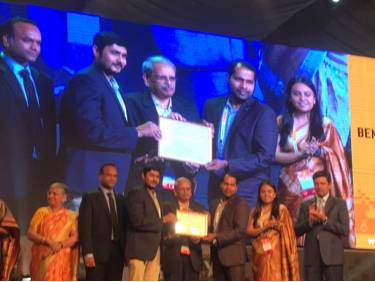 For these 25 awards, the government received more than 100 nominations from across Karnataka and it was open to all and not limited to startups registered with the government. The jury, comprising different industry verticals and Deloitte India, arrived at the winners who were honoured on the final day of BengaluruITE.biz 2016. These awards are being given in five categories — IT/ITES; ESDM (Electronic System Design and Manufacturing); AVGC (Animation, Visual Effects, Games and Comics); Biotechnology, Pharma and Life Sciences; and Social Inclusions. Can technology intervention quench the thirst of India’s drought-hit areas? Before the invention of micro-irrigation techniques like drip irrigation and the sprinkler, full flooding and furrow flooding of the field were the primary methods of irrigation. Water (for flooding) is primarily sourced from canals, ponds, bore wells and deep wells. Water use efficiency in the flooding method is 40 percent, which means that 60 percent of the water is wasted in distribution or evaporation. On the other hand, the drip and sprinkler methods can increase the water use efficiency to 60-70 percent, and when it is controlled electronically to regulate timing and quantity, water efficiency goes up to 80 percent. Maharashtra is reported to have the largest amount of unirrigated land under cultivation at 14.1 million hectares, followed by Rajasthan with 11.1 million hectares, Karnataka (7.01 million hectares), Gujarat (5.9 million hectares) and Andhra Pradesh (5.7 million hectares). According to the World Bank, only about 35 percent of total agricultural land in India was irrigated in 2010. “By leveraging innovative methods of irrigation, water consumption has reduced by 35-45 percent, productivity increased by 20-25 percent, energy consumption came down by 45 percent, the cost of cultivation reduced by 10 percent and overall income increased by about 30 percent. Capital expenditure in micro-irrigation is to the tune of Rs 30,000-75,000 per acre, and with government subsidies and extra income, pay back periods have reduced to one to two years,” says Ashutosh Sinha. A Masters in Agriculture sciences and business management from MANAGE, Hyderabad, Ashutosh brings with him 18 years of experience in agribusiness, energy and retail industries. He is also the former CEO of Villgro Marketing. He added that in places like the Vidharbha region of Maharashtra, North Karnataka and parts of Telangana, where ground water is not available, technology adoption will have to depend on water conservation methods and ground water recharge methods like check dams and field ponds. Founded in September 2014, eXabit’s TactiX-eHarvest helps farmers geo tag farmland, check the nearest market, railways, road or canal, connect to a farm consultant, record and analyse crop progress and access crop advisory services. TactiX-SCM enables various agri-allied services to manage the entire agri supply chain, with modules such as POP, inventory, logistics, warehousing, processing, distribution, invoicing and POS. Moreover, it’s BI (Business Intelligence) module can analyse all the data gathered at every step in the supply chain. eXabit has so far has served farmers in Bhopal, Hassan (Karnataka), and Kuppam (Andhra Pradesh), and is claimed to have digitised the data of hundreds of farmers. eXabit solutions enabled farmers with updated information on local weather forecasts, hyper-local or farm micro-weather details, along with crop advisory three times a day. It claims that their technology helped farmers increase their overall gross margin by 25 percent.